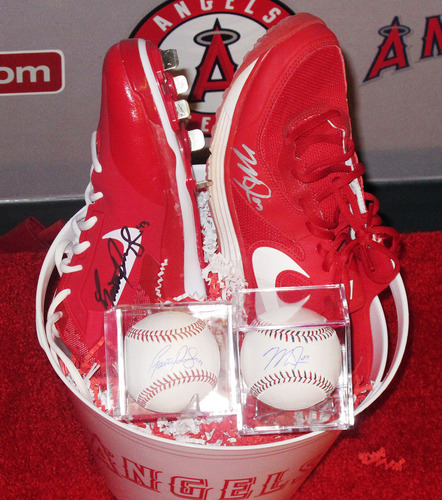 •*Due to unforeseen circumstances the meet and greet will now only be conducted with Mike Trout. * The opportunity for four (4) to watch the Angels take early batting practice from the field and a chance to meet Mike Trout. This opportunity also includes four (4) tickets to the Angels game at Angel Stadium of Anaheim on one of the following dates; September 15th, 16th or 18th. Please note that other restrictions may apply. This opportunity must be used on one of the three dates listed above, no exceptions will be made. 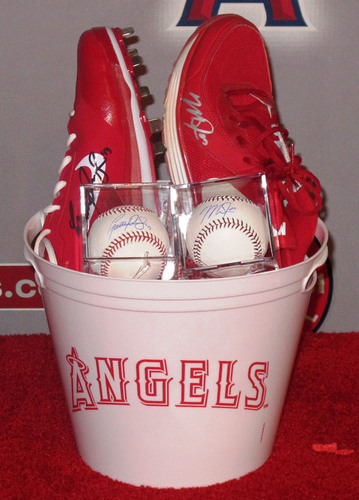 If you have any questions please contact the Angels Community Relations department at 714-940-2147 before bidding on this item. •By placing a bid on this item, you are expressly acknowledging the following conditions of this auction: all items are sold "as is." Please note that these items came directly from the player, they may be scratched, dented or scuffed. Memorabilia not authenticated by Major League Baseball is described above in copy and photograph(s) using best reasonable knowledge. One letter of authenticity for the entire basket will be shipped with the basket and will not be reissued at anytime under any circumstances. The Angels Baseball Foundation focuses on initiatives aimed to create and improve Education, Healthcare, Arts & Sciences, and Community related youth programs throughout the region, in addition to providing children the opportunity to experience the great game of baseball and its countless positive attributes.